1- What’s the max. load the Chairless Chair is able to support ? 2- To what height is the Chairless Chair adaptable to? -  The Chairless Chair is designed to be adaptable to any size between 1,60m to 1,95 m.
3- Does the risk for falling increase while wearing the Chairless Chair? 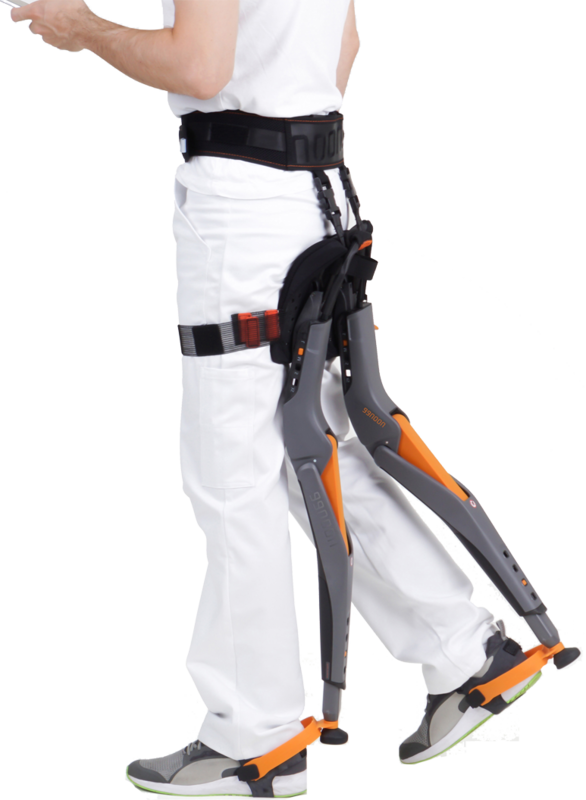 -  Studies as well as practical test have shown, that there is NO increased risk of falling for persons wearing the device. In addition, we train every user intensively in how to proper use the Chairless Chair. 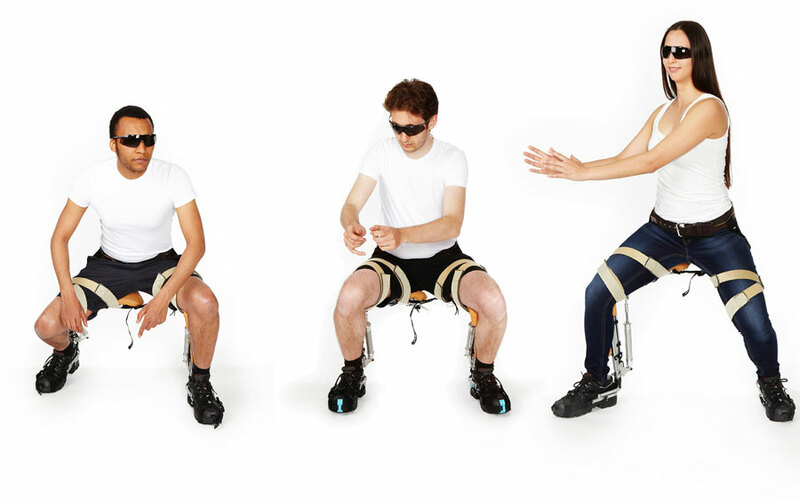 4- Is the Chairless Chair designed with private persons having back problems in mind ? -  No, the Chairless Chair is meant to be used in an industrial environment such as assembly or production lines. 5- What is the delivery time frame for a Chairless Chair? 6- Can the Chairless Chair be tested in person ? - Yes it can be tested in Teknorob facility. 7- Is it possible to climb stairs while wearing the Chairless Chair ? - No, climbing stairs is with the current version of the Chairless Chair not possible. 8- Is it possible for employees to share one device ? - This is possible, in this case additional textile packages may be ordered. In General, we do recommend tough that every employee has his or her own device available for use. 9- Are the textile parts of the Chairless Chair washable ? 10- Is there a need for regular maintenance? - During our extensive stress tests, we concluded, that the Chairless Chair, not including the disposable parts, does not require regular maintenance. 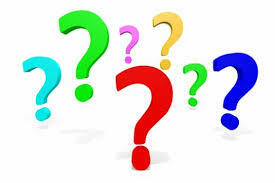 11- How long does it take to put on and take off the Chairless Chair ? - As part of our individual implementation training courses, we introduce each user to various ways of putting on and taking off the Chairless Chair. As a rule, it takes a maximum of 30 seconds to put on the Chairless Chair, and to take it off just under 10 seconds. 12- Do I really have to get trained on the Chairless Chair ? - As with any aid and support product, training to optimize the use of the Chairless Chair is essential. As part of our introductory program, in addition to the users, internal trainers (super users) will be trained, who will then provide their colleagues with advice and assistance in the future. 13- Is the Chairless Chair already in use ? - The Chairless Chair is now used by more than 100 companies in various industries around the world. 14- Does noonee have any reference customers ? - Yes, on request, an appointment with “best practice partners” can be arranged. 15- How can the Chairless Chair be cleaned ? - The Chairless Chair can be cleaned with a damp cloth or compressed air. In addition, the textile parts can be washed. Further cleaning is usually not required. 16- Is there a warranty ? - Yes for 24 months. 17- Are there temperature restrictions ? - We recommend using the Chairless Chair at a temperature of 0 ° C to 45 ° C.
18- Can you also use the Chairless Chair for a welding application ? - Basically yes. Depending on the sparks, the safety of the application must be checked individually. 19- How much does the Chairless Chair weigh ? - Without textile parts, the Chairless Chair weighs about 3.3kg. 20- Can the user put on the Chairless Chair without help ? - Yes. The individually optimal solution is trained as part of the Superuser/ Enduser training.